England series won, what now? The key to staying ahead of the curve in any field of competition is making changes before they are necessitated by failure. No coach is more aware of this than those who select and coach successful sports teams. They are constantly reviewing performances and looking ahead. For various reasons, there has been very little continuity-planning in South African rugby, from both a coach and player perspective. Instead, the Boks are asked to adjust to a completely new approach with every new coach, and with the incentive loaded towards winning now at all costs rather than a more sustainable, long-term view, the South African game has not grown at the same rate as some of the Boks’ fiercest rivals. With this in mind, the AOR team debate which selection experiment is the most important for Rassie Erasmus to conduct when the Boks face England at Newlands on Saturday. The combination of a six-year contract as SARU Director of Rugby and a successful start as Bok coach has given Erasmus an opportunity to look beyond this week and plan for the future. However, he doesn’t need to achieve this through a complete overhaul of the team. Instead, Erasmus can integrate new players into an existing unit, giving them the benefit of team cohesion and confidence and, more importantly, continuity. As such, I would not make more than four or five changes. And three of them would be up front. A start for Steven Kitshoff is obvious now that Beast Mtawarira is a centurion. Next to him, I would start Akker van der Merwe and new tighthead on the block, Thomas du Doit. The latter has had his detractors, including this writer – given my distaste for props switching sides while playing at the highest level, instead of earning that right via the club system. But I was one of the first to suggest that this particular switch could work, and what better time to find out if it has? Du Toit played off the bench in Bloemfontein last week, and his second scrum – the one that earned the Boks a penalty-try – was a sight to behold! It was, however, part of a fresh Bok front row against England’s tiring, starting combination. Of concern was the last-minute capitulation to a seven-man England scrum. I’d be both nervous and excited if I was Erasmus. Having gone 2-0 up in the series against a clearly unsettled England side, I’d use Newlands to gauge which of the two emotions is the right one. Bongi Mbonambi has seized with both hands a rare Test opportunity, Steven Kitshoff has been a wrecking ball, rookie lock RG Snyman has looked like a Bok veteran and playmaking imports Faf de Klerk and Willie le Roux have added zest to the attack. But the MVP of South Africa’s series-victory against England is Duane Vermeulen. In the absence of Malcolm Marx and Eben Etzebeth, Vermeulen has alone provided a cantankerous edge to the Bok pack. And, missing a proven fetcher, the 31-year-old has led the race for game-changing breakdown turnovers. However, Vermeulen is set for a stint in Japan that will rule him out for at least part of the Rugby Championship and year-end tour to Europe. It’s a major blow to Erasmus’ hopes of sustaining the wave of positive sentiment about the Boks. Wins win fans, and the odds of South Africa beating New Zealand for the first time in four years will only get longer when their most influential player is thousands of miles away. While it’s possible Jean-Luc du Preez will be asked to step into the breach, despite getting yanked after an underwhelming performance at Ellis Park, Vermeulen’s withdrawal will amplify Sikhumbuzo Notshe’s role. Unlike the Du Preez twins, Notshe will not jog onto the field with the tailwind of a strong Super Rugby campaign at his back – the Stormers greyhound has yet to make his mark in the competition. Siya Kolisi is set to continue leading the Boks in the Rugby Championship and that means Notshe is more likely to start at No 8 than openside flank. 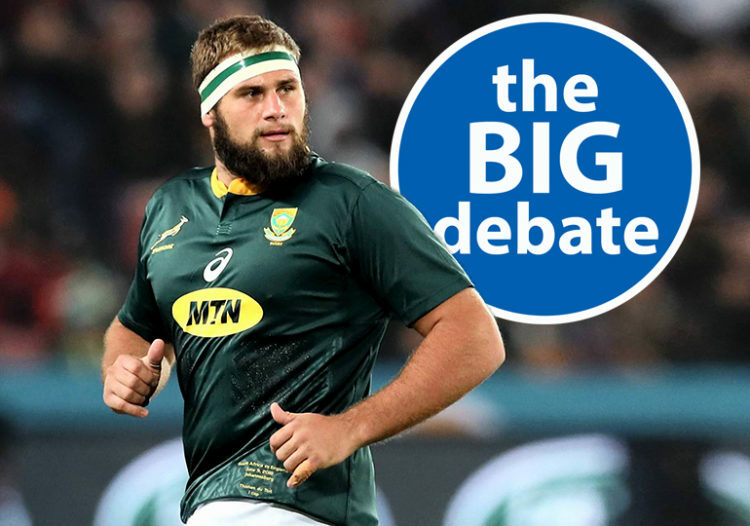 These are all reasons to start the three-cap loosie at Newlands with a view to him building confidence, form and experience, while Erasmus measures Notshe’s capacity for Test rugby before asking him to face the world champions. You’ve heard what they’ve had to say, now where do you stand in the Big Debate? Both make good points. I would also like to see one or two changes in the backs. Rassie now knows what De Allende and Am offer so maybe start with Esterhuizen and Kriel and Gelant off the bench. The problem is, with an all white front row (as Tank suggests) plus 2 white centres, Rassie would have to do a balancing act to meet the quota requirement. Maybe keep Bongi as starter. He is still fresh and the game time will be good for him. I got a feeling we are going to see some surprise selections. Completely agree! Tell me or anyone else for that matter, does anyone know what the official directive is in terms of transformation. I know that the full RWC world cup squad should have 50% representation, but that does not necessary include the starting team or starting 23 does it? Is there a specific directive for the starting 23 now before the RWC? I read somewhere that the minister of sport, could have been the previous one, said that they want 50% to play in the 23. One of Rassie’s KPI’s for this year is to reach that 50% in a playing 23 in at least one match. No we are not worried about the quota thing now. The reason it was an issue was because it was portrayed as if the team will lose when there is black players in the team. Now that it has been proven that it was utter nonsense to even imagine that thought- we don’t care if the entire team is pale white or dark black, as long as the boys pitch up on the day. Amen! Let the boys play! What players are still training with the squad that have not had game time or very little? Win the 3rd test. I like what Rassie said in not making the test cheap. With consistency you get continuity, team spirit and culture. Good luck Boys. Send them home with they tails between the legs. What will be next ? Surely the next test. Stop wining about white and black and start being part of the solution. Those that have not had a crack at the English as yet would be : Cameron Wright; Rob and Dan Du Preez, Andre Esterhuizen. Paper and Gelant. There is an absolute necessity to try someone else at 12. Damian turned the ball over 5 or 6 times last test. Firstly, he should be off-loading and secondly he need to learn a few tricks on ground work to protect the ball. I would like to see Esterhuizen and Am play. They are Provincial partners and understand each other! Cameron Wright was most favoured choice at the beginning of the international season at 9, based on SR form, I think he deserves a chance! Thom Du Toit at 3, is more a necessity than an experiment- both Louw and Malherbe have been off their best! I’m thinking that the ones sent back to their provinces will not be selected for now. Gelant; Esterhuizen and Mpimpi seem to be the most obvious ones to play in some or another capacity. Oupa is still training with the Boks? I think Gelant will definitely go to the World Cup. Esterhuizen may not make the cut, because we have Frans, Damian, Jesse and Am. But he’ll be the obvious replacement in case of injuries. Mapimpi also stands a good chance to make the World Cup squad. Generally 3 wings and 2 fullbacks are chosen for the world cup as it is a very small squad – 31 I think. Nkosi and Dyantyi’s places are probably sealed at the moment, but we need a couple more wings to get test exposure. Unless Combrinck regains his form. But Mapimpi is definitely in the mix for that number 11 jersey. “instead of earning that right via the club system.” I found this comment interesting. Does anyone know what the current state of club rugby is? Is it still a big factor? Aren’t Super Rugby and Bok Props, well Rugby players in general, coming through age group provincial and Varsity structures more rather than through club rugby? He should have given the Tank, the Warthog and Kitsie a start. They have been phenomenal this series. How Chilliboy leapfrogged 3 hookers who should be ahead of him is beyond me. Rassie is fully committed to transformation and feels Chiliboy can play a leadership role – like Bismarck or Schalk. But first he wants to see what Chili can do against England this weekend. In my opinion though, only one of Brits, Bismarck and Chiliboy will be chosen for the World Cup squad next year. Fair suggestions. Especially with the form Thomas is in. But I feel he should be slowly groomed from the bench. There is too much pressure in the beginning of test matches, and Thomas haven’t played one full season at tighthead yet. A great prospect for the future though. With Notshe I have mixed feelings. I always knew him as an exciting player but so far he never really made his mark playing for the Stormers. Perhaps playing for the Boks can bring the best out of him. But in my personal opinion, a guy like Marco van Staden will make a brilliant number 8 given enough games there. He’s such a utility player and a very strong ball carrier. Such a pity that he got injured on the same day the Bok squad was announced.